Topaz Electric Insulated grounding bushing with aluminum lay-in lug, has trade size of 1-1/4-inches and accommodates conductor of size 14 - 4-AWG. It measures 2.4-Inch Dia x 0.73-Inch. 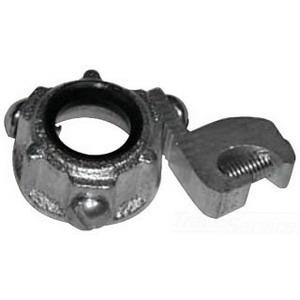 Set screws come with this grounding bushing for secure installation. This grounding bushing features malleable iron construction and thermoplastic liner rated up to 105 deg C. It is suitable for rigid and IMC conduits. It is perfect for use with copper or aluminum bare ground conductors. Grounding bushing is UL listed and CSA certified.